Received 28 October 2009; revised 10 January 2010; accepted 12 January 2010.
quence of this is a dramatic change in the biosphere. tered daily during all investigated periods with tap water. ence was the presence or absence of detergent in soil. could only be the result of the presence of detergent. stressed or control (nonstressed) conditions, respectively. 730 nm (F730) and 690 nm (F690) FIR = FIR690/FIR730. a pumpkin exposed to the γ-nuclear radiation . 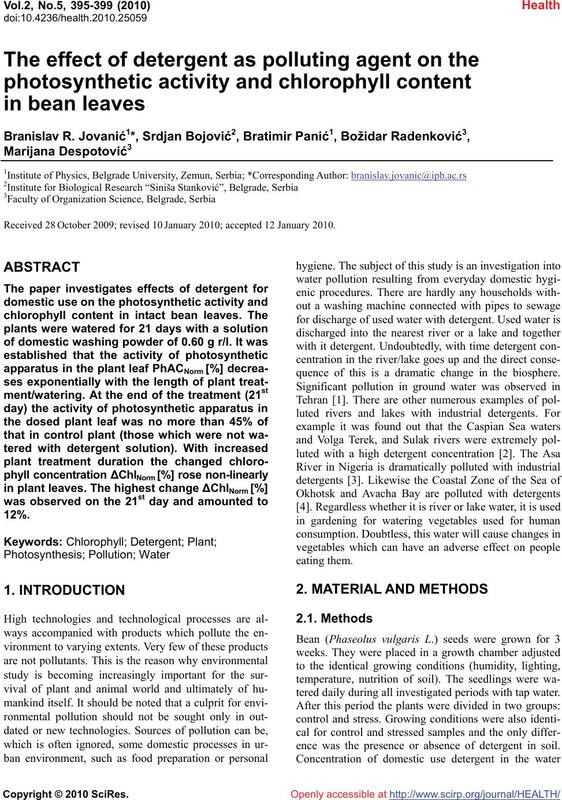 leaves during irrigation with water contain detergent. reach its peak on the seventeenth day at about 11.5%. maintain the reduced chlorophyll concentration. household synthetic abstergent (HSA) «Tix»  . membranes resulted in loss of PS I activities . PS II–LHC II varying size . want to thank Mr. P. Hiddinga on kindness in supporting equipments. Springer-Verlag Berlin Heidelberg, 5, Part P, 109-142. Monitoring and Assessment, 12, 157-163. Zhuravel, V.E., Bezverbnaya, I.P. and Buzoleva, S.L. Journal of Marine Biology, 30(2), 121-126. Burdon, F., Bouchaud, J.P., Tannoudji, A. and Levy, C.C. 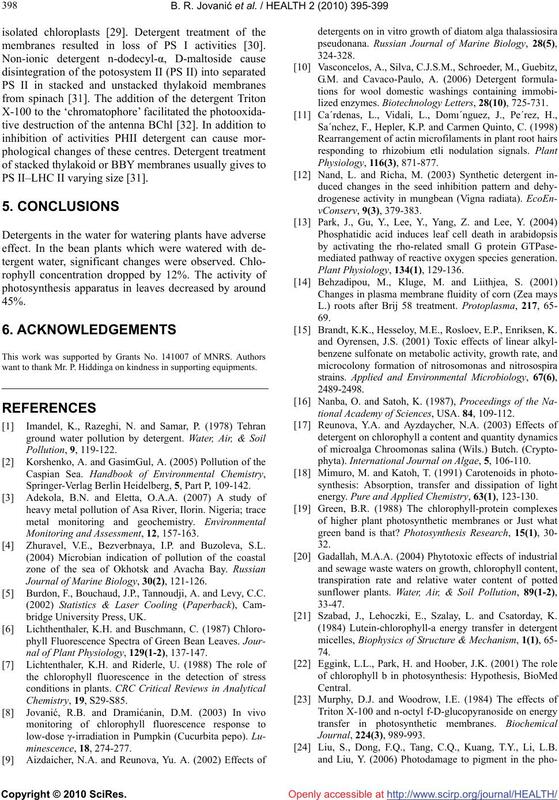 nal of Plant Physiology, 129(1-2), 137-147.
lized enzymes. Biotechnology Letters, 28(10), 725-731.
mediated pathway of reactive oxygen species generation. 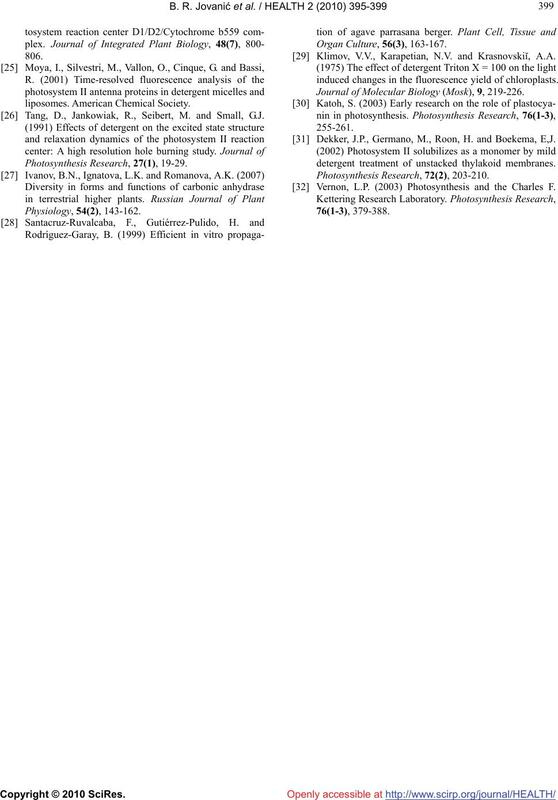 Brandt, K.K., Hesseloy, M.E., Rosloev, E.P., Enriksen, K.
tional Academy of Sciences, USA. 84, 109-112.
phyta). 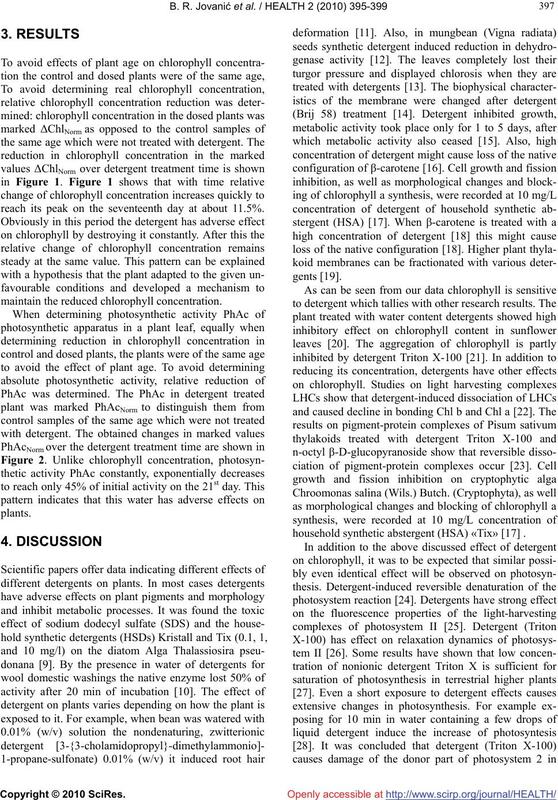 International Journal on Algae, 5, 106-110.
energy. Pure and Applied Chemistry, 63(1), 123-130. Szabad, J., Lehoczki, E., Szalay, L. and Csatorday, K.
 Liu, S., Dong, F.Q., Tang, C.Q., Kuang, T.Y., Li, L.B. Tang, D., Jankowiak, R., Seibert, M. and Small, G.J. 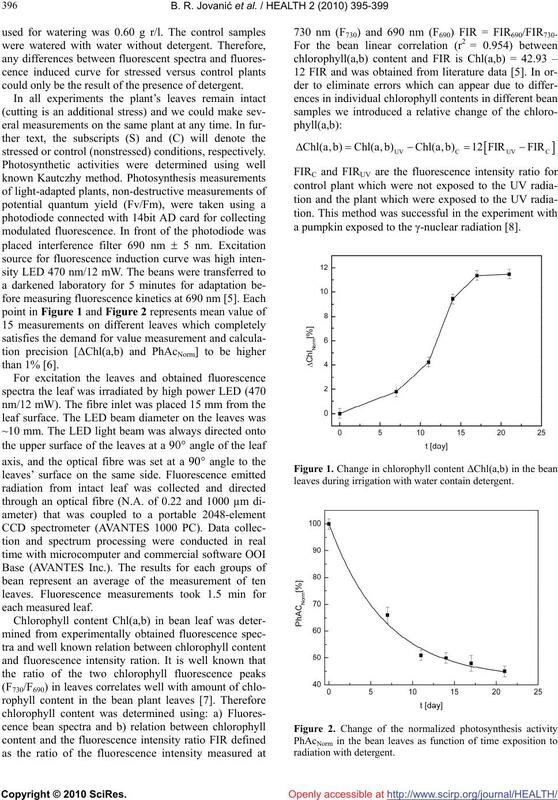 Klimov, V.V., Karapetian, N.V. and Krasnovskiĭ, A.A.
induced changes in the fluorescence yield of chloroplasts. Journal of Molecular Biology (Mosk), 9, 219-226. Dekker, J.P., Germano, M., Roon, H. and Boekema, E,J. detergent treatment of unstacked thylakoid membranes. Vernon, L.P. (2003) Photosynthesis and the Charles F.